The meal at the Black Horse pub was very good, although it was apparent we are now paying London prices. From the outside the pub looks old however once inside it has a more modern look. There were plenty of vacant tables and the staff were friendly. The heavy overnight wind and rain had pushed all the rubbish in the canal down to our mooring. It was bank to bank and looked disgusting. By the time we were ready to leave it had moved on. unfortunately in the same direction as us which meant we had to cruise through it. Actually I tried to glide through it with Waiouru in neutral. Despite this we picked up more multi-coloured London jellyfish. It seems rather pointless going down the weed hatch at this stage. I’ll wait until we reach Little Venice. After an hour of cruising we reached the 7 Day moorings outside the large Sainsbury’s at Alperton. There are moorings for three boats and we comfortably managed to fit in between the two boats already there. There is a large Chinese supermarket behind the Sainsbury’s which we will visit tomorrow. Today it was a quick trip to Sainsbury’s for essentials. Back again tomorrow to restock the cupboards. The engine has also reached 2050 hours and is now due for a major service. Apart from the oil, we already have all the consumables. A quick check on Google Maps showed a nearby Halfords so I walked there after lunch and purchased 10 litres of oil. At least tomorrow morning’s activities are now known! I took a photo of the moorings at Alperton on my way to Halfords using the old Samsung S1 with the custom ROM. Apparently the towpath at Alperton has been used in a number of episodes of the TV series Eastenders. Not that I’ve every watched the program! 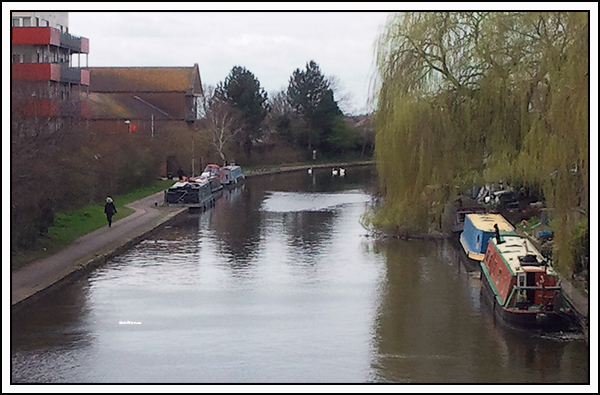 Whilst walking to Halfords I noticed the Pleasure Boat Pub on the opposite side of the canal. 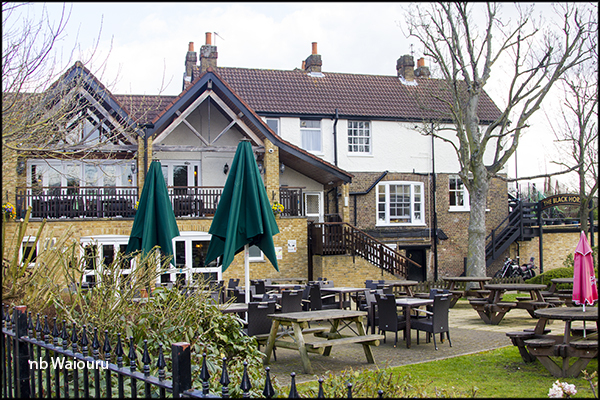 150 years ago the countryside at Alperton was a popular place for visitors who also frequented the pub. The canal became a celebrated resort for anglers (obviously not fishing for urban jellyfish or London eels). The area became less salubrious with the arrival of industry at the beginning of the 19th century. As the most industrialised village in Wembley, it was infamous for the smells coming from shipments of gas lime and dung, a sewage farm, two recycling plants and three large piggeries. There were public order problems with fights among labourers and bare-knuckle boxing bouts and cockfights. By the 1960’s Alperton was in decline. The major redevelopment around Wembley and Sudbury didn’t reach the area. However things started to change in the 1970’s with the arrival of many East African Asians (expelled from Uganda?) who opened shops along Ealing Road, selling saris, vegetables or sweets. Many of the public notices in the local area are multi-lingual. Interesting you make references to India (rubbish in canal) at the same time as extortionate London restaurant prices. Here in India our average restaurant meal for all three of us including drinks costs us round £10 In total!! We choose the best restaurants in the area and have not been disappointed yet. So far, after a week here we have spent around £100 all in for all of us.